I don’t remember much about Chernobyl’s accident because I was very little — only 4 years old. My parents, aged 44 and 47 at the time of the accident, my 8 year old sister, and I lived in Gomel (Belarus), located less than 100 miles north of Chernobyl. So I asked my parents to write what they remember about the accident. My father was a professor at a local university, my mother was an engineer. Click here to view the original Russian text. Click here for Natallia’s personal memories. In the first days after the Chernobyl accident there was neither news nor information about the accident from governmental organizations. People already knew something from many other channels: from phone calls of relatives living in the accident zone, from railway workers, from messages from the Scandinavian countries. I knew about high radioactivity in the area the next day because the equipment used by my students to measure the density of minerals with radiation in the laboratory read "off scale" all the time. Besides this equipment, there were only three advanced intermediate-level radiation meters in the city. Two of them were taken by .... service. All other detectors were designed for very high measurements in case of nuclear war. In a few days, we received Gorbachev's message about the accident. Despite of it, the country continued to prepare for the celebrations and demonstrations of May 1st. I had re-read radiation safety regulations and decided not to let you out of the apartment whenever possible. Then your mom and I made the decision to send you to Nizhni Novgorod. Gomel prepared simultaneously for both celebration and evacuation, openly and actively for the first, secretly and silently for the second. The information that you and your sister were leaving school was reported to the district communist party committee and I was threatened that I shall be held responsible for spreading panic. Weather in the end of April and beginning of May was sunny, wind was blowing north. I remember maneuvers of planes, which precipitated clouds to prevent their movement towards Minsk and Moscow. In the beginning of May we were waiting for another explosion, but fortunately it did not occur. After the holidays they had started to form groups for liquidation of consequences in southern cities. They washed houses, trolley buses, buses and sidewalks, and cut the upper layer of the soil from lawns. and further slowly decreasing. In the forest near our country house on May 3rd - 100 mR/h. The bus we took - 2500mR/h. In Ukrane, a southern hundred-kilometer zone of villages was being evacuated (so stupid!). They dug trenches and pushed houses into them and then filled up the trenches. The total radioactivity released was 5x107 Ci. 70% of all emissions settled in Belarus. The height of the emissions was 1 to 1.5 km. The main nuclides emitted were plutonium, strontium, cesium, iodine. Emission of gases and aerosols stopped basically by May 6th, and in five days all had settled on the ground. In the first days air masses were moving in northwest direction. More than 41,000 people live in territories with contamination of 10-40 Ci/km2 right now. The main source of contamination now is the consumption of contaminated foods, not external irradiation. The increase in diseases (practically all kinds of illnesses) has been registered. The reason for this is mainly weak immune systems, but mostly it is respiratory diseases, thyroid diseases, and cancer. It was on Friday, April 26th, 1986. I was on the sick-list with you. You had the chicken pox. But this day I for the first time decided to walk you on the street. It was sunny and hot. We walked around 11 a.m. to the store through a courtyard. I do not remember what we bought, but I lost my watch, it simply slipped from my hand. But I had no time to think about it because Alain came from school and your dad was coming shortly and I had to prepare dinner. When he came the first thing he said is that I had to wash all of your and your sister’s clothes. He mentioned Chernobyl. We looked at the map - just a small town somewhere in Ukraine, but close to Belarus. Soon we had a device that could measure radiation. We began recording measurements. I surveyed your sister’s clothes before and after washing. The difference was dramatic. After April 26th there was a long weekend and people certainly used it for getting out camping or just spending some time outside. On Monday everybody had started talking about the accident. The press was keeping silent. Then the first news arrived. They said only one person died at the site - burnt alive in the fire and they could not recover the body. Then the number of casualties started to grow. They transported everybody (dead and still alive) to Moscow hospital. They buried the bodies in a cemetery. There was probably a whole cemetery that was radioactive. The next time I took you to see a physician, I met a woman who brought her children to check for radiation in the waiting room. She had just come from Bragino (she had relatives there). Hoyniki, Bragino, Korma, and Rogachev were especially radioactive. No one could understand anything because radiation was an invisible enemy which caused consequences later. Radio and television were mostly quiet, and if there was news, no alarm was sound. So I sat at the doctor’s office thinking what to do. When it was my turn to see the doctor, I asked him about radiation and told him my concerns. He didn’t give me direct answer at first, but as I kept pushing, he said that if I can I should send you as far away from this place as possible; he also said that one of the signs of radiation exposure is vomiting. When the holiday came, the TV was showing demonstrations in Kiev, bicycle races, and other entertaining events. Sometime around May 5th there was news about the possibility of a second explosion. I was trying to figure out what to do. By that time Alain was getting sick. She was vomiting every day after returning from school. She was a first grader. We decided to send you to my parents not waiting till the end of the school year. I submitted my request of a two-week vacation at work. I also told all my co-workers (group of 30 people) to send their children away if they could. My manager did not let me take vacation. I did not know then, that it was strictly forbidden to all managers to release people from work. Then I have asked my manager: "How is your son doing? Is he OK?" He didn’t answer. Then I said: "Well, maybe your son sleeps well, by my daughter vomits every night in bed, therefore here’s my vacation notice and I’m off. I shall be at work on May 18th." Your dad took me and the two of you to the train. As we traveled to Nizhni Novgorod through Moscow, the train was packed with kids. I was afraid that we would be stopped in Moscow at epidemic control. We had to go to different train stations, and I chose a route to avoid being stopped. Traveling with you was not easy because I had luggage and two little children. We took a bus from one station to another, where I met my coworker’s wife who was taking her two sons to Saratov. When we arrived at the station, I sent a telegram to my parents in Nizhni Novgorod so they would know when to meet me. It was really hectic at the station; I was afraid to lose you and you were not cooperative. You either asked to eat, drink, pee, or poop. I barely found the right train, and asked to board from the wrong side. It was hard to get up to the train without a platform, but we made it. As we arrived at our destination we were told that all people from Belarus must report to Epidemic Control. So we went there. I told them that we were from Gomel. They put as a bus and took us to banya. It was cold, and we had no soap or fresh clothing. It was Saturday so most of the stores were closed. I did not wash my hair. After a bath they surveyed us with a meter. Then I was told that I should wash my hair once again, so I did. Then the guy pointed at you and said to us: "You are free to go, but this girl must be transferred to the hospital." So they took us to the hospital. 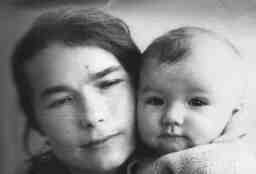 Town Hospital discharged most of the kids who could be treated at home to free up places for Chernobyl children. By that time, the city was full of children from Belarus. At the hospital, we were asked where we came from, why we came, and who had told us to come. I told them the truth about where we were from, but I told them I was told to come on the TV. Local people were very nice and understanding to us. People who wanted to help were bringing food and clothes to the hospital for sick kids. Soon there were so many of it that admission office prohibited bringing goods for children, because they had no way of storing it. After leaving you at the hospital, we returned to my mother’s house, and she could not understand why I had to wash my children’s new clothes. I told her that you can’t burn radiation and you can’t brush it off, you can only wash it off. I sent your sister to the local school so she could finish the first grade. My vacation was over but you still couldn’t be discharged. I came back to work and left you and your sister at your grandmother’s care. I was returning back home with a sense of fulfilled duty; I had put you in the care of my parents. But, after getting back to Gomel, my manager prepared a surprise for me and other employees who sent their children away. He assigned us a project in Korma (30 km inside of the exclusion zone) for one month. At the end of the month they took our blood tests, but never gave us any results. There were rumors that the Japanese offered help, but asked for large payment, so the government turned it down. 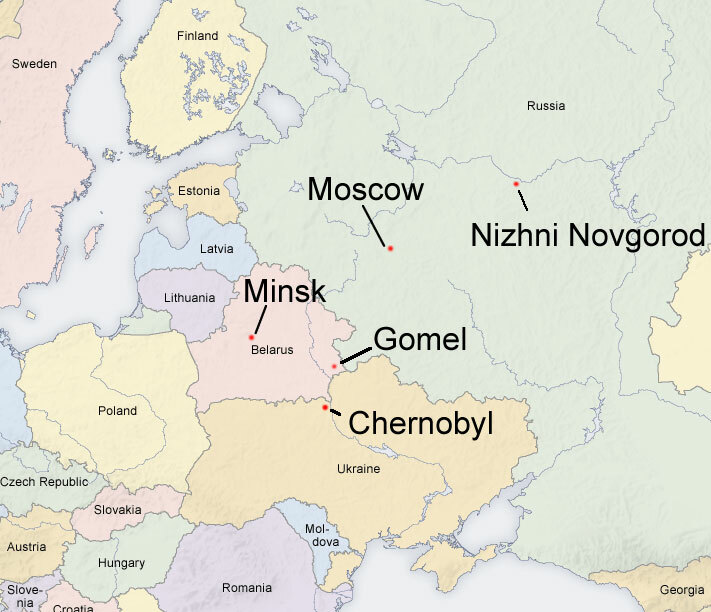 Instead, the government took a compass and drew a 30km circle around Chernobyl, and evacuated everybody inside it. However, the spreading of radiation was random, so there were clean zones within the exclusion zones and contaminated areas in the "clean" ones. Later we found out that for the first 10 days after the accident we were supposed to take antistrumin (an iodine supplement), but it became available with prescription only at the end of May. You came back from Russia in the beginning of September. You had an appointment with endocrinologist, who checked your thyroid. It was abnormally enlarged - second degree. But assessment was done by hands, because no medical equipment was available. Government was trying to support kids from contaminated areas with financial help and other privileges, and tried to make sure that each child would be in a clean zone at least once a year. At the end of May, they also put on a show and even Gorbachov and his wife went to the destroyed nuclear plant and Pugachova gave a concert there. But after USSR's crisis there was no money, they stopped paying us alimony and declared Gomel a "clean" zone. May 1st was one of the biggest holidays in USSR (Labor Day), which was always celebrated by large demonstrations on the streets. The city is located in Central part of Russia. Towards Gomel, Minsk and Moscow. He refers to the fact that the villages in the south were destroyed though the radiation there was low while the northern villages remained in tact though the radiation there was high. Refers to the year 2004. Mothers were allowed sick time if their children were little or required care around the clock. Banya is a public bath house similar to a sauna. To the best of my knowledge there were 3 degrees of thyroid enlargement: with the first being the weakest, and the third being the worst.